Jackie and I live in a small part of San Antonio that is heavily populated with an ethnic variety of people. A large percentage of which come from India, and therefore we have 4 or 5 Indian food restaurants in a 2 mile radius of our apartment. Being that Jackie loves Indian food, we’re in a good spot. Now I’m not a lover of Indian food, but I don’t hate it either. I’m somewhere in between. Needless to say, Jackie was surprised when I told her I was going to cook a Chana Masala dish that I found on The Post Punk Kitchen. Being vegan these last two months has made me a bit more adventurous in the food realm. So I thought… why not. First of all, if you’ve never been to The Post Punk Kitchen, you need to check it out. It’s world famous vegan Isa Chandra’s website which is home to a plethora of vegan dishes from entrees to desserts. We first came across her site about a year ago when our server at Green told us that Chandra was her vegan hero. Chandra is kind of a creative vegan cooking master, so check out her site. In a large deep pan heat coconut oil over medium high heat. Cook onions for several minutes until they begin to brown and caramelize. Add in your jalapenos, ginger, and garlic mix well and cook about 1 minute more until it becomes fragrant. Mix in your cilantro and let mixture cook about 1-2 minutes until cilantro is wilted. Sprinkle your spice mixture over the dish and mix well to make sure everything is getting some of that spice love. Let the mixture cook another minute or so to allow the flavors to meld. NOTE: it works best to combine all spices in a small bowl and sprinkle together over pan. Add in your diced tomatoes and mix well. The pan will sizzle because of the tomato juice, so use this opportunity to deglaze the pan by scrapping the bottom. Add in your chickpeas and agave. At this point you’ll want to cover the pan and turn the heat up slightly and let the tomatoes cook down and chickpeas heat up. Do so for about 5-10 minutes. Remove lid and give the dish a good stir. Isa Chandra recommends cooking another 20 minutes uncovered at a low temp to give the flavor more time to cook. I only did about 10 minutes and then served it over a bowl of rice. 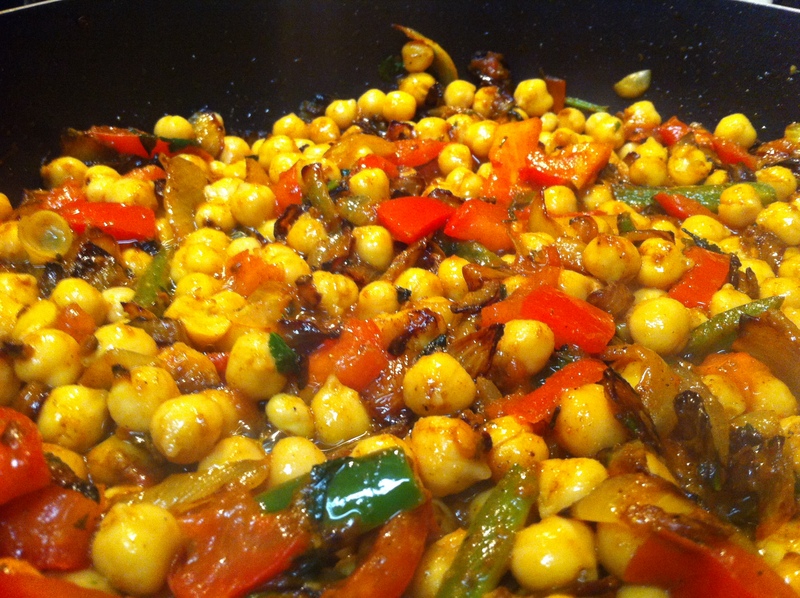 For Indian food lovers and everyone else, this is a tasty dish. Again, all credit goes to Isa Chandra of The Post Punk Kitchen for this recipe. I hope you enjoy it too!